Bladder wrack Fucus vesiculosus, from here. 'Wrack' is one of those lovely old-fashioned words that doesn't get used anywhere near as often as it deserves. As well as being an alternative for the word 'wreck' (such as in The Wrack of Hesperus), it refers to a number of larger brown seaweeds, including the subjects of today's post, the Fucaceae. 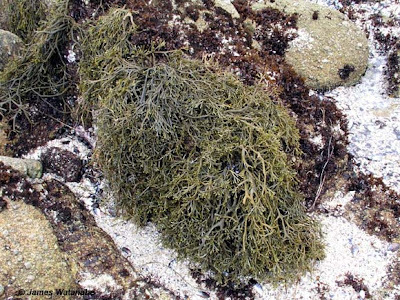 The Fucaceae are dichotomously branching seaweeds mostly found in the intertidal zone. 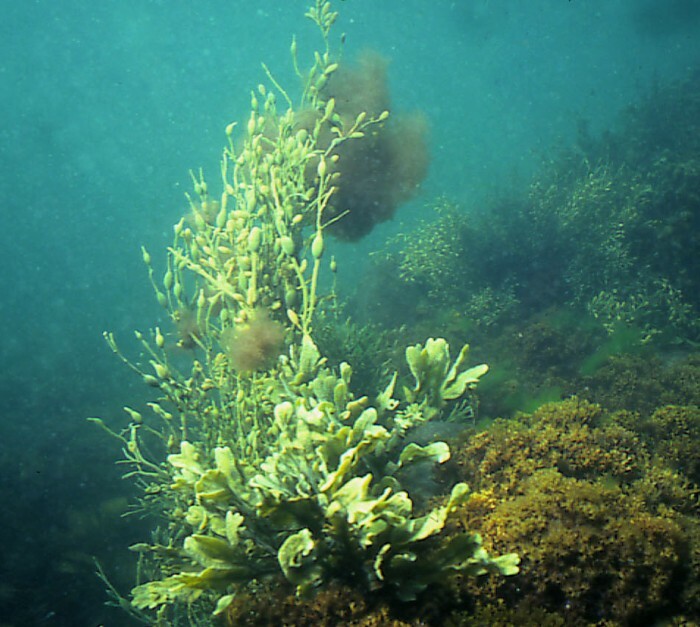 They vary in size from smaller forms growing higher in the littoral zone (such as the 15-cm-or-less Pelvetia fastigiata) to quite large forms growing lower down (the mid-littoral Ascophyllum nodosum may have fronds two metres in length). Fucaceae are distinguished from other families of brown algae by features such as their well-defined apical and marginal receptacles, and the single four-sided apical cell on each frond (Cho et al. 2006). 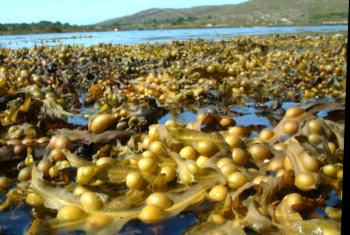 Fucaceae also differ from some other brown algae in lacking a free-growing haploid stage in their life cycle: haploid cells do undergo a few rounds of post-meiotic mitosis within the receptacles, but are released as individual eggs and sperm that immediately fuse to found the diploid generation. With the removal of the Australasian Xiphophoraby Cho et al. (2006), the Fucaceae has become a strictly Northern Hemisphere family. This is interesting because the larger clade of the Fucales to which the Fucaceae belong is mostly Southern Hemisphere in diversity. Representatives of the Fucaceae are found both in the Pacific and the Atlantic, with a distinct flora in each (only a single species, Fucus distichus, is believed to be native to both oceans, though some would separate the Pacific population as F. gardneri). Cánovas et al. (2011) favoured a Pacific origin for the Fucaceae, on the grounds that this provided the most intuitive biogeographical connection to the related Australasian taxa Xiphophora and Hormosira, but parsimony analysis alone was unable to confirm or deny this scenario. Basal clades within the family include representatives in both oceans. The North Pacific Silvetia compressa, photographed by James Watanabe. Though currently divided between six genera, the family is not speciose, and only two of those genera include more than a single species: the Pacific Silvetia (three species; previously included in Pelvetia but removed by Serrão et al. 1999 on the grounds of non-monophyly) and the mostly Atlantic Fucus (eight[?] species). The clade may be fairly recent in origin: though estimating an age is complicated by the relatively poor fossil record of brown algae, Cánovas et al. (2011) estimated with molecular dating that the Fucaceae diverged in the mid to late Miocene, with their ancestors possibly crossing the equator as Australia moved north. Complicating matters, species of Fucaceae can be morphologically very variable: in the 1960s, for instance, H. T. Powell revised the 100+ species, varieties and forms then recognised within Fucus down to only six species (Serrão et al. 1999). These species can be divided between a northern, specifically cold-water clade with the rockweed Fucus distichus and the toothed wrack F. serratus, and a more warm-water-tolerant clade containing the remaining species (Cánovas et al. 2011). These species tend to be ecologically distinct, each preferring slightly different microhabitats within the littoral zone, but they can hybridise where they come into contact and reproductive isolation is probably not complete (Zardi et al. 2011). Two further species of Fucus have been recognised recently: F. guiryi is a north-eastern Atlantic species previously recognised as F. spiralis var. platycarpus (Zardi et al. 2011; the name 'Fucus platycarpus' cannot be used for this species owing to homonymy), while F. radicans is a species unique to the relatively low-salinity Baltic Sea (Bergström et al. 2005). All indications are that Fucus radicans is a recent segregate from the more widespread bladder wrack F. vesiculosus, which is also the only other Fucus species found in the Baltic. The Baltic Sea itself is not, in its current form, very old, and molecular data suggest that the divergence of F. radicans may have only happened within the last four hundred years (Pereyra et al. 2009). Knotted wrack Ascophyllum nodosum, from Fisheries and Oceans Canada. Bergström, L., A. Tatarenkov, K. Johanneson, R. B. Jönsson & L. Kautsky. 2005. Genetic and morphological identification of Fucus radicans sp. nov. (Fucales, Phaeophyceae) in the brackish Baltic Sea. Journal of Phycology 41: 1025-1038. Cánovas, F. G., C. F. Mota, E. A. Serrão & G. A. Pearson. 2011. Driving south: a multi-gene phylogeny of the brown algal family Fucaceae reveals relationships and recent drivers of a marine radiation. BMC Evolutionary Biology 11: 371. Cho, G. Y., F. Rousseau, B. de Reviers & S. M. Boo. 2006. Phylogenetic relationships within the Fucales (Phaeophyceae) assessed by the photosystem I coding psaA sequences. Phycologia 45 (5): 512-519. Pereyra, R. T., L. Bergström, L. Kautsky & K. Johannesson. 2009. Rapid speciation in a newly opened postglacial marine environment, the Baltic Sea. BMC Evolutionary Biology 9: 70. Serrão, E. A., L. A. Alice & S. H. Brawley. 1999. Evolution of the Fucaceae (Phaeophyceae) inferred from nrDNA-ITS. Journal of Phycology 35: 382-394. Zardi, G. I., K. R. Nicastro, F. Canovas, J. Ferreira Costa, E. A. Serrão & G. A. Pearson. 2011. Adaptive traits are maintained on steep selective gradients despite gene flow and hybridization in the intertidal zone. PLoS One 6 (6): e19402. The bubbles are, of course, there to help it float. No, they were put there by God to tempt us to pop them, Chris.